In Home Viewings: "The Woman in Black"
When his wife died during childbirth, Arthur Kipps (Daniel Radcliffe) sank into a deep depression that results in a distance from his young son and the derailment of his law career. Given one last chance to regain his footing within his fim, Arthur is sent to a remote village to sort through the personal papers of a dead woman and sell her house. It is a simple job designed to get his life back on track. But when he arrives, he discovers that the house has a dark history in which he soon finds himself engulfed. An evil presence runs roughshod through the very fabric of the town and threatens not only Arthur’s life but also the life of his son. The Woman in Blackis a very straight-forward, simple film that tells a concise but worthwhile story in just the right amount of time. One of its strengths is the implementation of a very limited cast. This is basically a two man show, with Radcliffe either working alone or opposite Ciaran Hinds, who fits his part perfectly. The two work well together and by keeping the importance of the supporting parts to a minimum, director James Watkins prevents his film from falling into the cringe-inducing, “How does that person have a SAG card? !” performances that plague most horror movies. Much is put on the shoulders of Radcliffe, then, and as such, I’d call this a modest success for the young actor. This role is enough of a departure from his days as Harry Potter and yet familiar enough as to seem comfortable. It isn’t a stunning performance by any means but it is strong enough to hold water. The next two or three roles will be even more important for Radcliffe in terms of preventing himself from being type cast but this is a step in the right direction. Watkins also succeeds in creating a terse tone from the very beginning of the film and carrying that through to the very end. 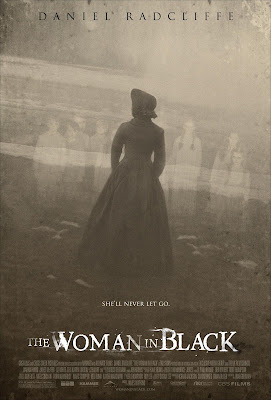 The Woman in Black rarely holds back as the thrills and chills start early and come often. As a result, most of twists feel very natural, though the final turn seems a bit forced to me. I was legitimately freaked out at times and Watkins does a great jump of bringing the obligatory jumps and more drawn-out terror together into a mix that never really lets the audience get settled in. I don’t much care for scary movies of either the spooky ghost or psycho killer variety and as such, I rarely enjoy them. When I do have a good experience with this sort of film, it’s usually one that features decent acting, manages to create a genuinely tense atmosphere, and relies on consistent terror over gore or cheesy jumps. The Woman in Black hits each of these marks and delivers a satisfying if unspectacular product that is filled to the brim with suspense. There’s nothing great or even entirely unique at play here but this film is good on many levels and that was enough to win me over.